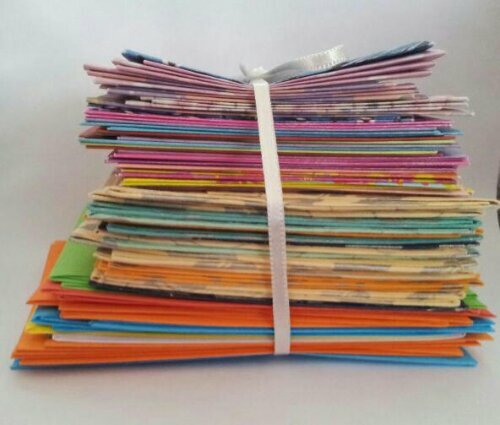 I recently face booked a picture of my newly completed pile of handmade envelopes which caused much interest, so I set out to find the tutorial I used in the beginning so others could have a go – to no avail. So – cos I’m such a luffly person I wrote it all down for you and took pictures and everything. My method has evolved somewhat since that first tutorial – they involved cutting mats, posh paper knives and fold scorers etc which frankly is a faff and imho not necessary, but if that’s your bag or if your cutting isn’t very straight then go for it! In this day and age, of eco friendlyness etc, getting a box for each and every gift just seems like overkill. Who keeps the box when you receive a piece of jewellery? Probably just jewellery makers who can recycle them! But you want to make a nice presentation to show your recipient that you have put thought into their gift, and that you care that they like it, so this is the perfect solution. My beads, where possible, come in a pretty envelope too now, it just gives that extra handmade care and attention ‘edge’ I think. How exciting to receive an order of new beads all wrapped up nicely! Currently, the shop called ‘The Works’ is doing a 3 for 2 offer so you can pick up a couple of packets of handmade paper and a reel of thin double sided tape for about £4 and this little lot will do you quite a huge pile of envelopes! Optional – hole punch, ribbon, promotional stickers. Ok to practice I recommend you start with some scrap A4 paper. Take 2 sheets, cut one in half lengthways and one in half width ways. This is just an exercise to show you what’s possible and what size they come out when they are done cos it does still seem to surprise me how much smaller they are than expected! Take one of your pieces and then fold into 3. Bear in mind that one bit will be the flap and the other two will be the envelope bit so ensure the flap folds neatly at the point where the top of the envelope meets the flap fold. You can make your flap any length, but how much you use for this will determine how much you have left for the envelope so if you want a bigger envelope, make a smaller flap. Ok open the side flaps back out and fold the envelope back up. You essentially need to bevel the corners so take some scissors and start at the joint between the two folds – ie the envelope fold and the side fold – and make a slightly diagonal cut. The less of an angle you use the better otherwise you end up with less to glue and ultimately holes in the sides of the envelope. 4 corners, 4 snips. Now open it all out. You need just one ‘flap’ per side, and this will be the center piece of your tri-folded paper, so trim away the side flaps from the front piece of the envelope body. You want a pointy envelope flap so fold the sides in more to make a blunt point and trim those too. Fold the side flaps inward, apply glue or ds tape and fold the front over and then the flap down and there you have your envelope! So what I do now is either make a little slit in the flap, or punch a hole with a hole punch, and add some ribbon either enough to wrap all the way around the envelope and tie in a bow, or to make a tassel that I can glue down with one of my stickers. You can of course just stick the flap down with a sticker too! Hope that all makes sense, try with your different sized scraps of paper and see what happens.